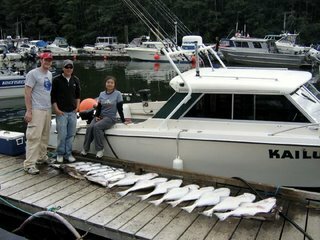 Glenn from Back for More Charters sent in this photo of a great day’s fishing out of Port Renfrew. That kind of fun is hard to beat. 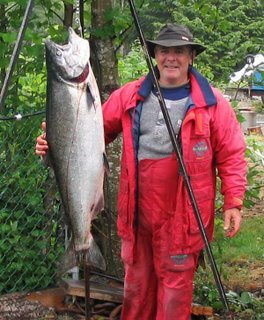 Word out of Port Renfrew is that a 56 pound spring salmon was caught earlier this week, and there are coho approaching 20 pounds. Very impressive, in the “fish of a lifetime” category. 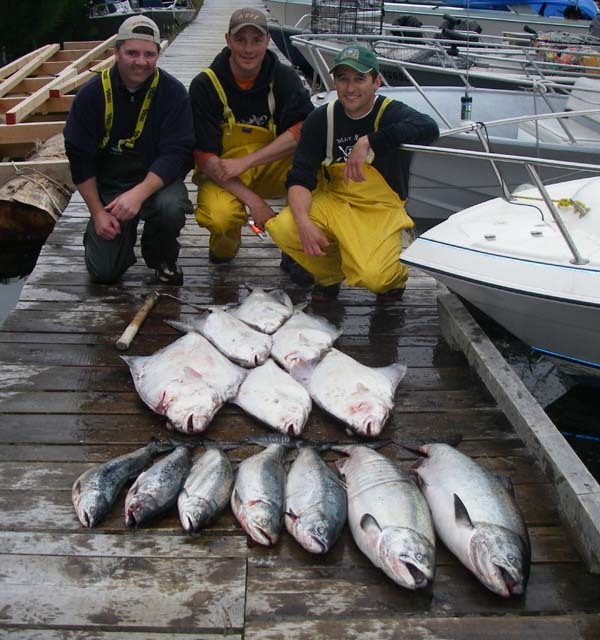 There is still lots of halibut on Swiftsure Bank, and coho too. 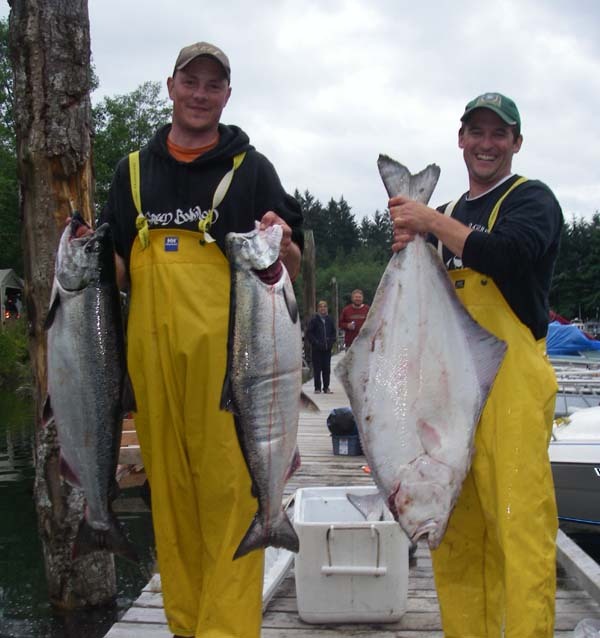 It is a great time to be fishing Port Renfrew. 21 pounder, 25 pounder, 25 pounder. We got these fish up by Logan Creek on anchovy. Nice for a change to hear a story of friendly and polite fishing, in our busy and competitive world. 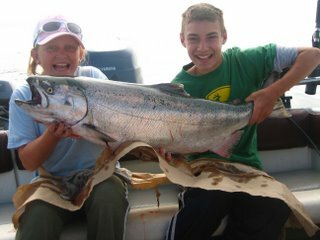 Port Renfrew Marina sent a photo of 46 pound Spring Salmon caught by No Bananas Charters….nice one! 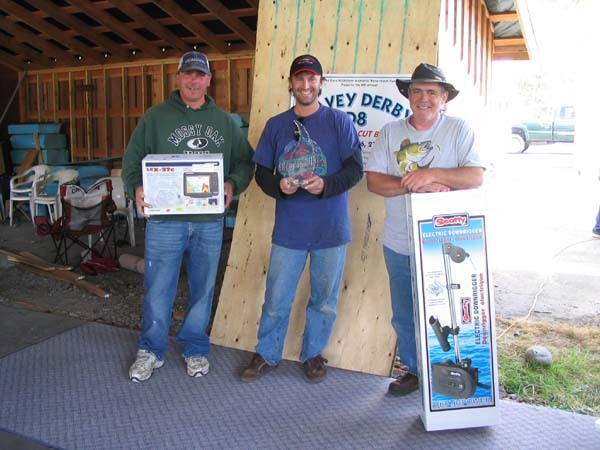 Port Renfrew Marina will be having its 11th Labor Day Derby this year on Aug.30th and 31st. Tickets will be available in the office a few days before the derby. Tickets are $50. 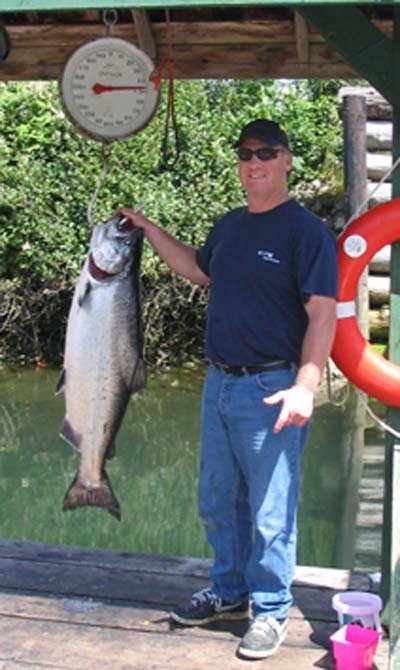 a rod and includes dinner, beverage, Port Renfrew Marina t-shirt. There will be a live band on the 31st. All proceeds will go the to the local fish Hatchery in Port Renfrew. They are looking for donations for prizes — give them a call 250-483-1878, Toll-free: 1-866-565-2354 or email info@portrenfrewmarina.com. Port Renfrew’s Coho Derby is tentatively set for Sept.27th and 28th. Date to be confirmed in the near future. 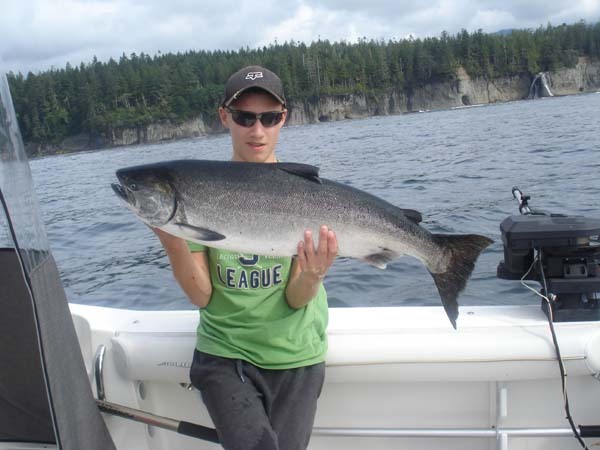 Port Renfrew fishing is reported as pretty good in the past week. Some days hotter than others, but with decent fish caught most days. Port Renfrew continues to be the best fishing spot in Southern Vancouver Island. Out at Swiftsure Bank, Jolly Rogers reports it continues to be as hot as ever for halibut, with most boats getting their limit of 10-25 pound halibut quickly. The good news is there is lots of decent-sized coho out there, and you can’t beat that for sporting fun. Closer to Port Renfrew, the inshore spots continue to tease and deliver, with the bite time and location varying from day to day. 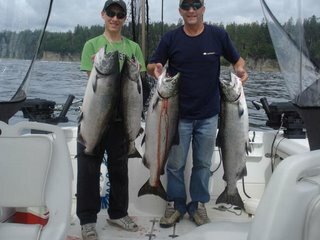 No Bananas reports a couple of good days in the last week (from the sportfishingbc forum): “fishing was good again today with the hot spots being east point or logan. There was an all day bite with some big fish. Biggest being 45 caught by the banana boat 41 ft off logan creek. [a few days later] Renny remains very good,the morning bite is decent until the huge ebb current kicks in then it is hot and heavy when the afternoon flood starts up. Most boats are limiting on that tide. There are still some big ones around, the banana boat got a 46 on Sat”. 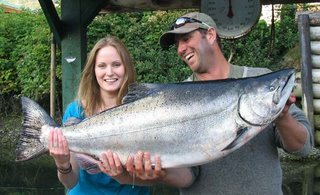 Two salmon over 40 pounds in a week…those are some happy guests, going home with some big fish and bigger fishing stories. ** arrive 9 pm at Port Renfrew Marina. 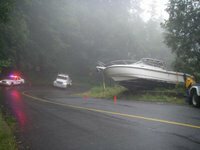 Along the way see a 27’ Whaler flipped on its side on the steep switchback west of Sombrio. Trailer was pushing the truck downhill, 4 wheel slide on wet pavement. Then it slid sideways, rolled once or twice. Driver felt lucky it turned sideways, rather than landing on his truck and maybe killing him. Woah, reality check…this is serious business. ** motor out in the gloom at 5:15. Straight to Logan Creek, get a 22lb Spring. ** Head out to the “chicken ranch”, south-west corner of Swiftsure Bank. Fairly bumpy from windchop in night and a residual windswell, can only do 15kts. Peasoup fog, 100 foot visibility, freighter foghorns…quite eerie. Once out there, 20 or so boats around. 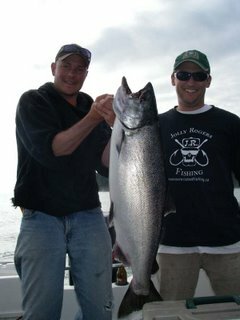 ** Backtroll for halibut as well as jig buzzbombs for coho. No hali bites, and aren’t seeing anyone nearby get any. Catch some decent sized coho though, half wild, half hatchery. Really fun playing them shallow, jumping all over the place. ** Pull up the gear and think about going elsewhere, decide to first troll for coho and see what the rest of the pack is doing. Get to another spot 100m away, everyone around is playing halis. We drop the gear too, bing bing bing, 3 or 4 in 20 minutes, limit an hour or so later. By this time, fog has cleared, swell subsided, it is glassy calm and hot. Best weather I can imagine for west coast Vancouver Island. We are getting into a “it doesn’t get any better” day. ** Amazing whale show a few hundred metres west, with humpbacks breaching over and over, every 20 seconds or so for 10 minutes, then disappeared. Also saw grey whales by Carmanah on the way in. ** Drop the gear at Logan on the way home, get into a 28 lb Spring. Great fight. ** Back in the San Juan Bay, crab trap full of 20 or so, but all female or undersized. ** Back to Port Renfrew Marina after 14 hours on the water. Home at 10:30, 2 more hours of butchering and packing. TIRED and very very satisfied. Epic day! A bunch of great Port Renfrew fishing photos from Dan Burkmar. 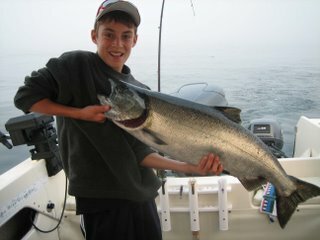 Dan (14 years old) caught a 21 and 32 pounder. Nicole (12 years old) caught a 32 pounder as well. All caught at Camper Creek, on anchovies. 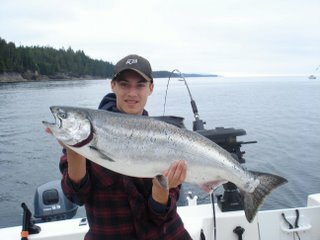 Welcome to the Tyee club! Dan reports: “All of the fish really hard fighters like they always are in Renfrew.” Nice! Fishing is still reported as hot and cold for springs, although there seems to be decent salmon being caught on “The Beach” (Logan Creek to Camper Creek), with a fair number of 20-35 pounders coming in. 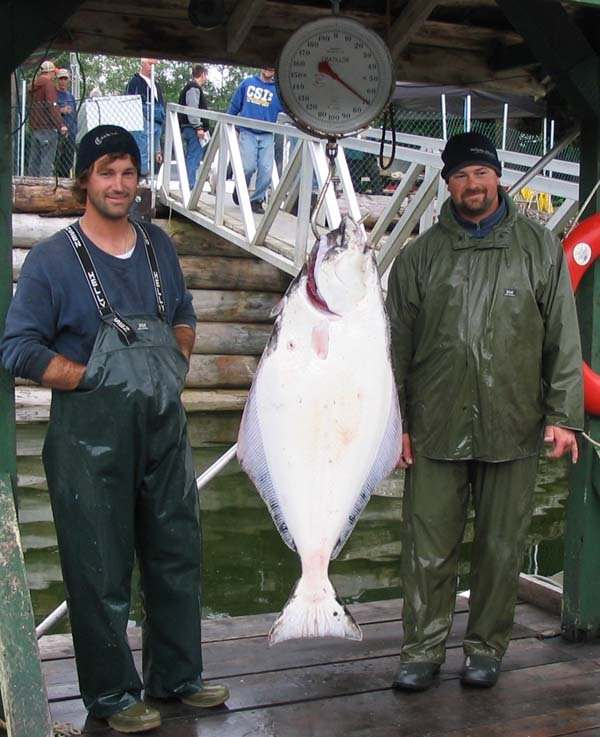 There is plenty of chicken-sized halibut, 15-30 pounds, off Swiftsure Bank. 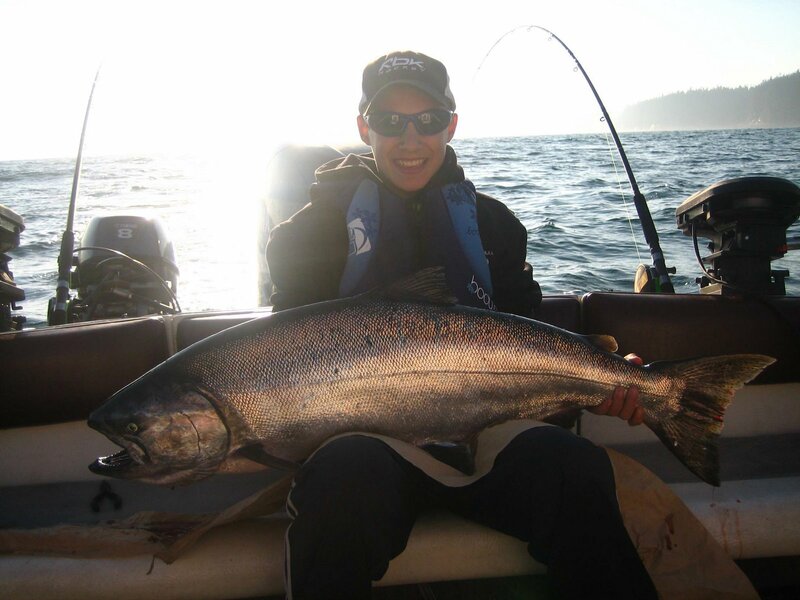 As well, the coho are in, with fun surface fishing action. Some foggy days, so bring your GPS. Although Sunday it burned off, leaving hot sun and the seas as calm flat as you’re ever likely to see on West Coast Vancouver Island. So, you never know what you’re going to get until you get out there. Mike Johns from Heavy Hauler reports that Port Renfrew’s salmon fishing has been slow in the last few days, with some of the guides going all the way to Pachena looking for springs. 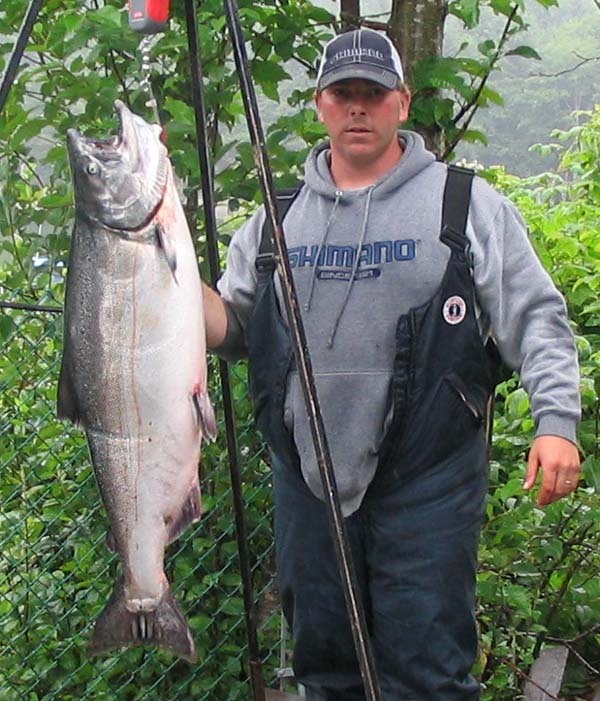 He says the coho have shown up in great numbers off of the 170 on Swiftsure Bank, which is good news. He says the halibut fishing has continued to produce, with his last charter landing a nice 89 lb halibut and some quality ling cod. 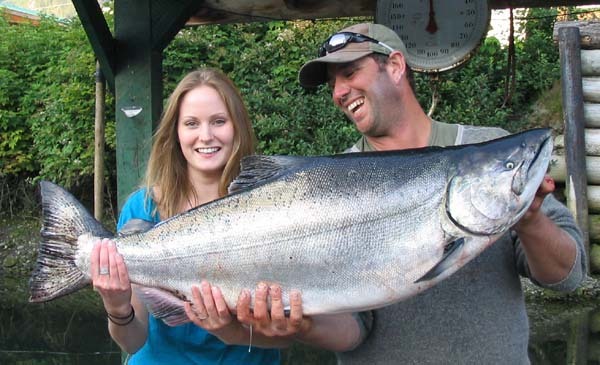 Jolly Rogers backs up this report, stating there’s Spring salmon to be had every day if you stick with it and work for them (although a little bit of luck doesn’t hurt). He also says the halibut have been plentiful on the Bank as well as coho. 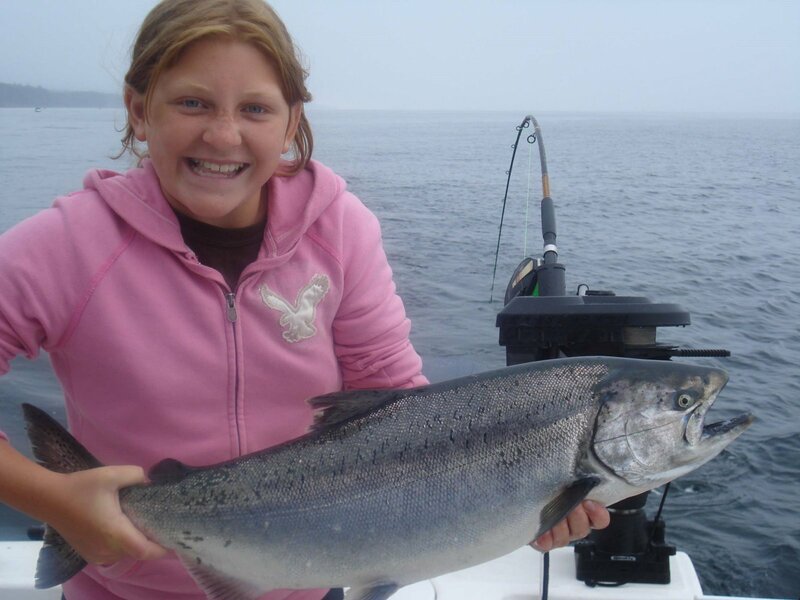 The coho are good sized salmon around 8 pounds. 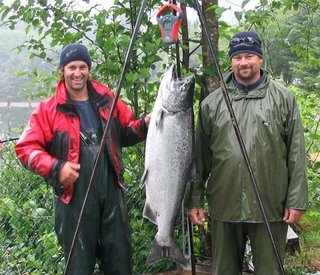 His guests have been having fun with a 6 weight fly rod loaded with light monofilament….get an 8 pounder on that light gear, and it will fight harder than a Tyee. Puts the sport back into sportfishing! So…Port Renfrew continues to be worth a go. There’s some slow moments, but still decent fish being taken — the only way one’ll be yours is if you dip a line. 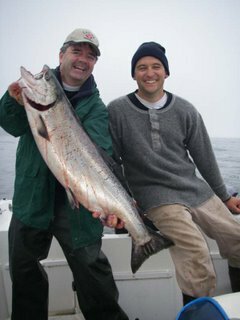 And if you have the means to get out the Bank, now’s the time to make it happen, because when both the halibut and coho fishing are good, it is amazing fishing fun out there. Sockeye is closed once again, just days after it started. So much for that! Port Renfrew Marina has some pictures from derby weekend. Due to technical difficulties, they having some trouble posting them, so we are temporarily posting them on their behalf. Nice fish! Congrats to all the winners and thanks to the contest organizers and to the Marina for hosting this event. 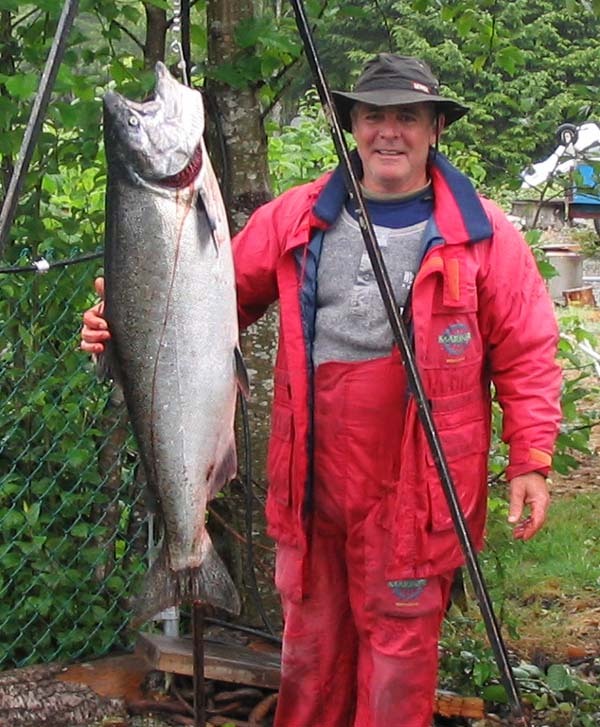 You are currently browsing the Port Renfrew Fishing Report blog archives for August, 2008.